These burritos are the solution to so many problems. No time to make breakfast? Need something quick to take to work for lunch? Home late from work and too tired to cook? Yes, they are breakfast burritos, but let’s not get technical. 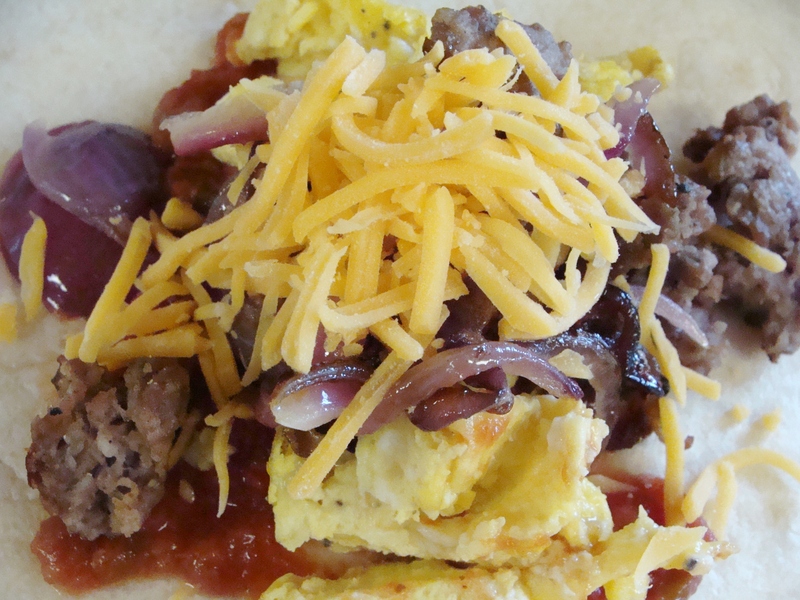 These burritos featured sautéed onions, browned sausage, scrambled eggs, salsa, and cheddar cheese. The salsa is key, because it keeps the burritos from drying out when you heat them in the microwave. *a rare glimpse into the filling of a breakfast burrito. First, cook your sausage until it’s nice and brown. Drain on a paper-towel-covered plate. Set aside. Next, thinly slice your red onion. Drizzle olive oil in a skillet over medium heat. Add onion slices and cook until they begin to brown. Set aside. Scramble your eggs, taking care to remove them from heat while they are still slightly runny. Season with salt, pepper, and garlic powder, if you like. Set aside. Now, gather up all your ingredients in an assembly line! Before you fill each burrito, nuke the tortillas (two at a time) in the microwave for 10-15 seconds. This will prevent tearing. Spread a generous spoonful of salsa on your tortilla. Top with some eggs, sausage, onions, and sprinkle with cheddar cheese. Close your burrito! Fold two long sides over first, then fold over the ends. It creates a little pocket. 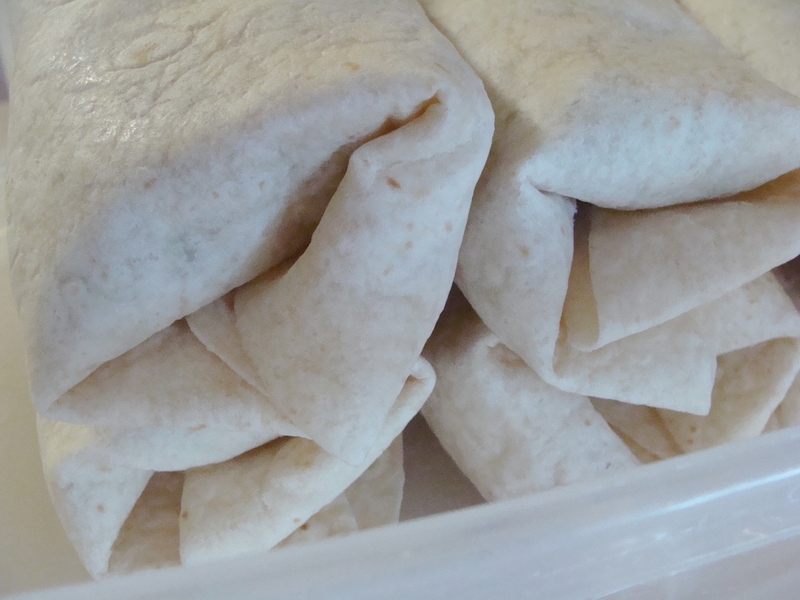 Wrap each burrito in foil and place in a sealed container in your freezer. To heat, wrap burrito in a damp paper towel for 2-3 minutes. Little burrito bundles, waiting for their foil wraps! § One Response to freezer breakfast burritos. You are currently reading freezer breakfast burritos. at The Cheesy Kitchen.